A husky relaxing in the snow. Husky means sounding hoarse, or being heavy built. An example of something husky is a voice of a person with a cold. An example of a husky person is someone who is a bit overweight. The definition of a Husky is an Arctic sled dog. 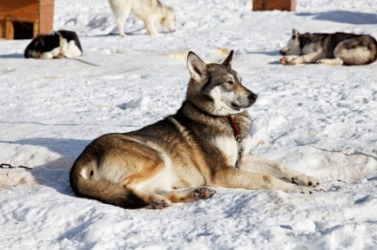 An example of a Husky is the Greenland Husky. "husky." YourDictionary, n.d. Web. 21 April 2019. <https://www.yourdictionary.com/Husky>. Hoarse or rough in quality: a voice husky with emotion. Heavily built: clothing sizes for husky boys. A dog of any of various compact, thick-coated Arctic breeds developed as sled dogs, especially the Siberian husky. Abounding with husks; consisting of husks. husk +‎ -y; in relation to voice, from the sense "dry as a husk" or "tough as a husk". Shortening of husky dog, where husky is ultimately from the same Old Montagnais root as Eskimo. He gave a husky laugh at her words. How does that work, Sofia? he challenged in a husky tone. Her voice had lowered into a husky purr. Deidre's heart flip-flopped at Gabriel's husky baritone.